These whales are found in all oceans and adjoining seas, except polar and tropical regions. These animals occupy temperate and sub Polar Regions in the summer, but migrate to sub-tropical waters during the winter. Most whales are between 12.2 and 15.2 meters long. Sei whales have a relatively slender body with a compressed tail stock that abruptly joins the flukes. The snout is pointed, and the pectoral fins are short. The body is typically a dark steel gray with irregular white markings ventrally The ventrum has 38-56 deeps grooves, which may have some feeding function. The Sei whale obtains food by skimming through the water and catching prey in its baleen plates. These whales feed near the surface of the ocean, swimming on their sides through swarms of prey. 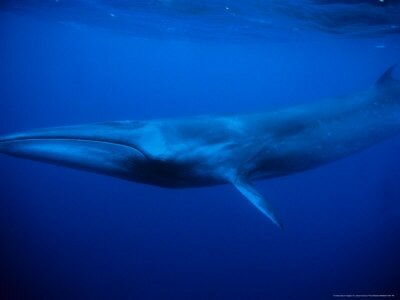 An average Sei whale eats about 900 kilograms of copepods, amphipods, euphausiids and small fish every day.